Flue Gas Treatment methods including selective non-catalytic reduction and selective catalytic reduction. These are post combustion methods that reduce NOx emissions after formation. Fuel Reburning which involves injection of natural gas after primary fuel combustion. It is typically used on very large boilers firing residual oil or coal. 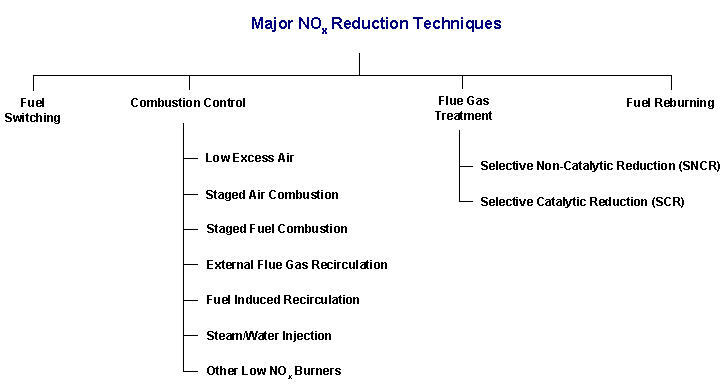 A basic description of the major techniques is given in this “Overview” section, further details on each technology provided in the subsequent sections, and a summary table of achievable reductions is given in the section “ Summary of NOx Reduction Performance”. Refined oils, such as No. 2, generally contain less than 0.05% fuel-bound nitrogen. Residual oils can contain up to 0.6% fuel-bound nitrogen. While natural gas contains some nitrogen, it is in the form of nitrogen gas, not the organic compounds that lead to fuel NOx. Conversion to natural gas firing will significantly reduce NOx emissions. When firing fuel oils, NOx formed by fuel-bound nitrogen can account for 20-50% of the total NOx level. One method to reduce NOx levels from boilers firing distillate oils is through the use of natural gas or low nitrogen fuel oil. Combustion control techniques reduce NOx formation during the combustion process by controlling the flame temperature and/or oxygen concentration. They are generally more economical than flue gas treatment (post combustion) methods and are frequently utilized on industrial boilers. As a safety factor to assure complete combustion, boilers are fired with excess air. One of the factors influencing NOx formation in a boiler is the excess air level. High excess air levels may result in increased NOx formation because the excess nitrogen and oxygen in the combustion air entering the flame will combine to form thermal NOx. Limiting the amount of excess air entering a flame is accomplished through burner design and can be optimized through the use of oxygen trim controls. Low excess air firing can be used on most boilers and generally results in overall NOx reductions of 5-10% when firing natural gas. Staged Combustion involves changing the air and fuel flow patterns in order to reduce the peak flame temperature and oxygen concentrations. Enlarging the flame results in lower flame temperatures and lower thermal NOx formation which, in turn, results in lower overall NOx emissions. The technology can be applied to most boiler types and sizes. Staging can either be done internally within the burner body – these designs are frequently incorporated into “Low NOx Burners” (LNB). Staging can also be done external to the burner through the separate introduction of fuel and/or air through different ports within the boiler furnace. External flue gas recirculation utilizes an external fan to recirculate the flue gases back into the flame. External piping routes the exhaust gases from the stack to the burner. A valve controls the recirculation rate, based on boiler input. Induced flue gas recirculation utilizes the combustion air fan to recirculate the flue gases back into the flame. A portion of the flue gases are routed by duct work or internally to the combustion air fan, where they are premixed with the combustion air and introduced into the flame through the burner. New designs of induced FGR that utilize an integral FGR design are becoming popular because of their uncomplicated design and reliability. By injecting water or steam into the flame, flame temperatures are reduced, thereby lowering thermal NOx formation and overall NOx levels. Water or steam injection can reduce NOx up to 75% (when firing natural gas) and can result in lower reductions when firing oils. There is a practical limit to the amount of water or steam that can be injected into the flame before condensation problems are experienced. Additionally, under normal operating conditions, water/steam injection can result in a 3-10% boiler efficiency loss. Water or steam injection can be used in conjunction with other NOx control methods such as burner modifications or flue gas recirculation. Some advanced designs of steam injection technology do not have as significant an impact on boiler efficiency. Selective non-catalytic reduction involves the injection of a NOx reducing agent, such as ammonia or urea, into the boiler exhaust gases at a temperature of approximately 1400-1600°F. The ammonia or urea breaks down the NOx in the exhaust gases into water and atmospheric nitrogen. Selective non-catalytic reduction reduces NOx up to 70%. Selective catalytic reduction involves the injection of ammonia in the boiler exhaust gases in the presence of a catalyst. The catalyst allows the ammonia to reduce NOx levels at lower exhaust temperatures than selective non-catalytic reduction. Unlike selective non-catalytic reduction, where the exhaust gases must be approximately 1400-1600°F, selective catalytic reduction can be utilized where exhaust gasses are between 500°F and 1200°F, depending on the catalyst used. Selective catalytic reduction can result in NOx reductions up to 90%. However, it is costly. This involves the injection of natural gas after primary fuel combustion. It is typically used only on large utility power plant boilers firing coal or residual oil. It is a three-stage combustion process based on fuel staging.